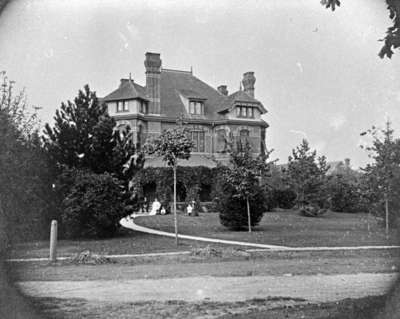 A black and white photograph of the residence of Judge Duncan J. McIntyre with people sitting outside. The house located at 320 St. John Street West was built in 1881 for Judge George H. Dartnell, of the Ontario County Courthouse. He was succeeded by Judge Duncan John McIntyre. Left to Right: Judge Duncan J. McIntyre, Mrs. Duncan J. McIntyre, Duncan Brodie McIntyre.